There are more than 50 airports in Norway, making even the northernmost communities accessible by plane. The three largest domestic airlines are SAS, Norwegian, and Widerøe. All the large cities and towns in Norway have airports catering for both international and domestic flights. 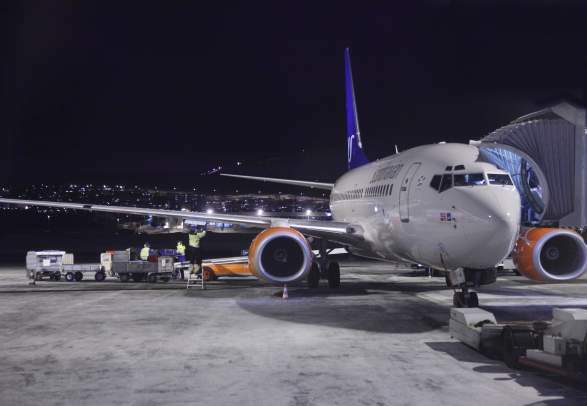 In fact, there are more than 50 airports throughout the country that are serviced through regular routes, making even remote places such as the Lofoten Islands, the North Cape and Svalbard easily accessible by plane. However, you should be prepared to maybe change planes once or twice in order to reach your final destination. The main international airports in Norway are located in Oslo, Bergen, Stavanger, Tromsø, Trondheim, Ålesund, Haugesund and Sandefjord. Find more information about airports in Norway. Norway is the country in Europe with the most airline trips per capita, and the routes from Oslo to Trondheim, Bergen, and Stavanger are all amongst the ten busiest in Europe. See where the ten busiest airports are located and start planning your air travel. Filter your search and find information about airports and airport transportation.